Near the end of the week, I'm always ready to get rid of the little bits and pieces and leftovers that are sitting around my fridge. You know, the 3 pieces of bacon, the handful of almost-bad spinach, the sprinkling of cheese, the half of tomato, the quarter of an onion. Yeah, all those. 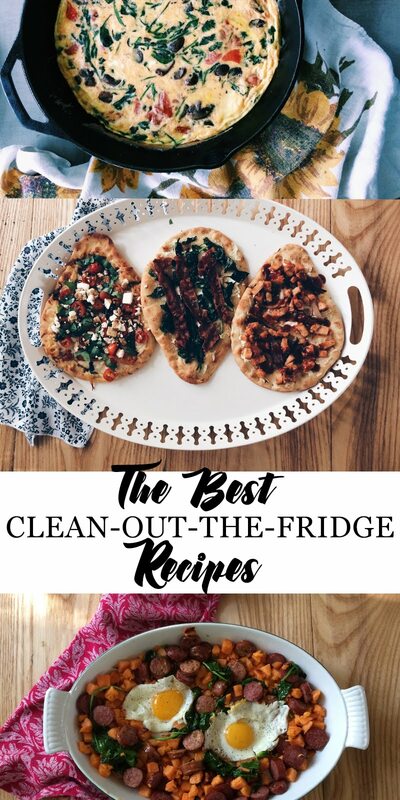 As someone who hates to waste food, I've perfected a few go-to clean-out-the-fridge recipes. I thought you guys might like them too, in case you find yourself in one of those moments. And the reason I love these recipes so much is because, really anything goes. You can pretty much make almost anything sitting in your fridge work with a little creativity! I love to buy the naan bread from Aldi and keep it in my freezer for these very moments. 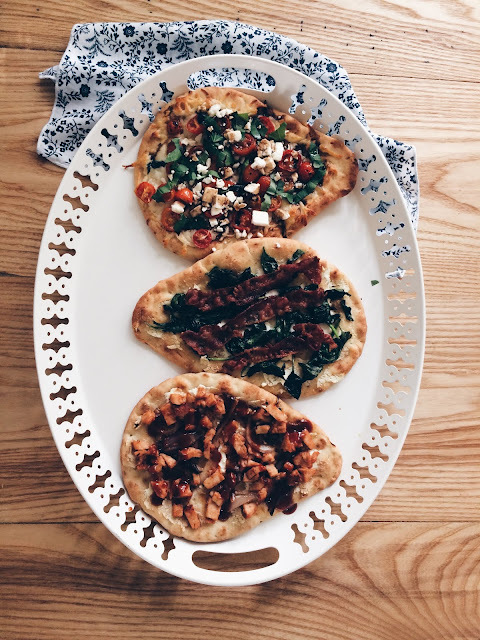 They're perfect for making creative pizzas. And you guys know about pizza, you can make almost anything go. Don't have pizza sauce, spice up your tomato/spaghetti sauce. Don't have any sauce? Make a white pizza with garlic and olive oil. I almost always have everything I need to make these happen. I just top them with whatever I have in my fridge, put them on some tin foil and pop them on the grill for a bit. Don't feel like grilling? Just bake them until cheese is melted. 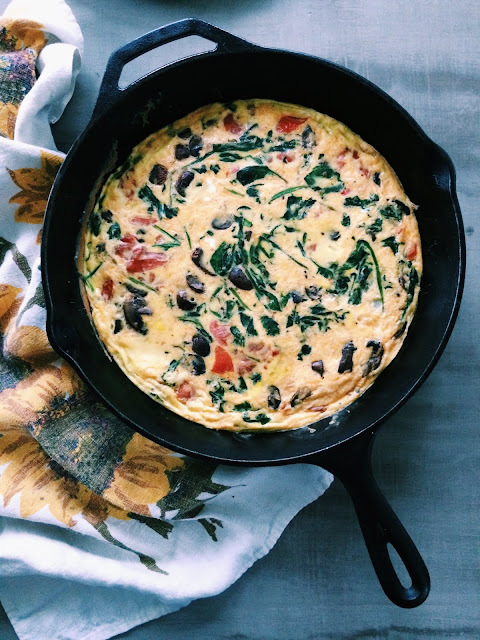 Depending on what I'm wanting to get rid of I usually waffle between classic quiche, crustless quiche or frittata. If I have a lot of potatoes I want to get rid of, I opt for the making the frittata. You can seriously throw almost any meat or veggie combo in these and the more the merrier is usually my rule of thumb. My favorite is classic quiche because who doesn't love pie crust but if I don't have pie crust or am cutting back on carbs, crustless quiche is the best way to go. This recipe is another good one if you want to use up potatoes before they start sprouting a million eyes. 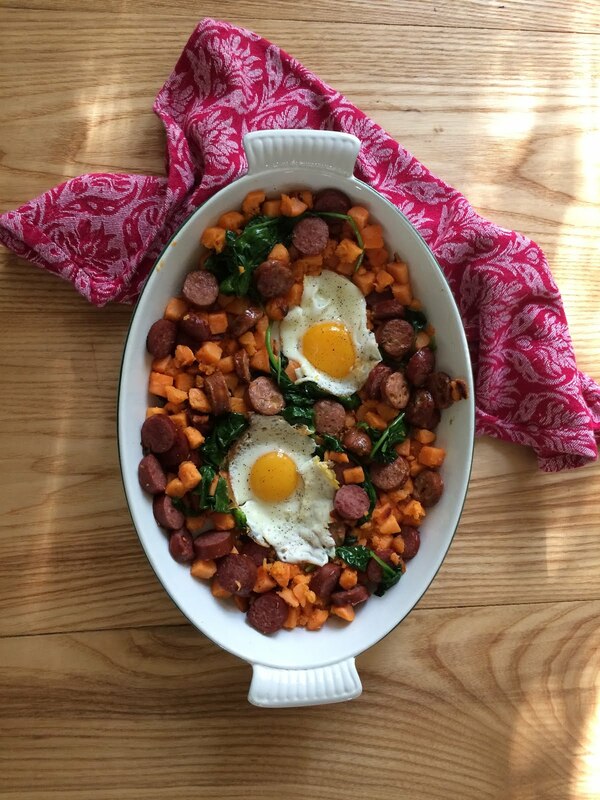 Sautéed sausage and potato is my usually base and then I throw in whatever else is hanging out in my fridge. Usually adding in some combo of, green beans, brussel sprouts, apples, onions, and almost always topped with a fried egg! Hoped this helped give you a few ideas for when you're ready to clean out your fridge!